The Call for Entries for the 2019 Design Awards is now closed. 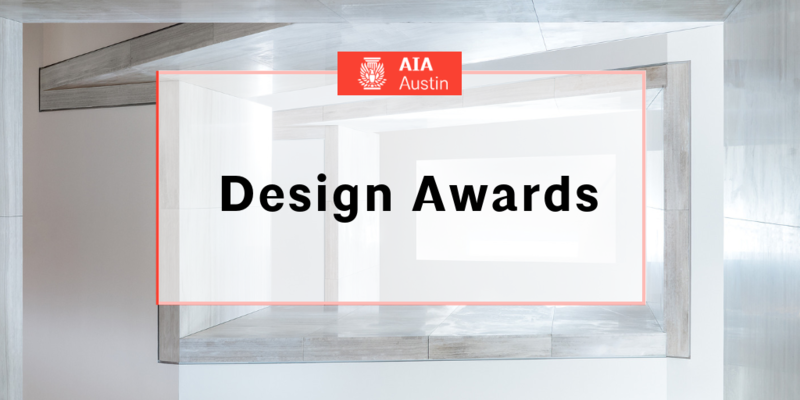 The AIA Austin Design Awards recognize outstanding work completed by AIA Austin members that spans a diverse spectrum of project sizes, types, locations, and clients. Each year, an invited jury of respected architects reviews submitted projects and selects exceptional projects. Compelling projects are commended for their architectural design, technical ability, environmental response, and/or social impact. Innovation is recognized at multiple scales, from urban strategies down to detail resolution. This year we want to highlight the importance of sustainable design—the jury may select an award winner to also receive a commendation for sustainable design at their discretion. Over the span of his twenty-two-year tenure at Olson Kundig, principal and owner Kevin Kudo-King has played an integral role in the design, production and management of numerous award-winning projects. In collaboration with fellow owners Tom Kundig and Jim Olson, Kevin has led the design of museum gallery expansions, large-scale international residential projects, and urban mixed-use projects, among others. Kevin is known for his collaborative design practice, which is deeply informed by the history of craft and artistic production. His designs emphasize an integration of art and architecture that is grounded in a contextual response to the natural conditions of a site, many of which are international. Kevin is currently working on projects in Indonesia, Costa Rica, New Zealand, Mexico, and China. Aric Lasher is Director of Design at HBRA Architects, where his projects have included buildings for government, cultural, academic and public institutions, residential projects, landscapes, renovations and restorations of historic structures. Mr. Lasher graduated from the College of Architecture, Art & Planning at Cornell in 1984 and has a Master of Fine Arts in film production from the USC School of Cinematic Arts. In addition to his work in architecture he has designed sets for numerous films including Minority Report, Pearl Harbor and What Dreams May Come. Aric is a Fellow of the American Institute of Architects, and his professional affiliations include the Society of Midland Authors, the Art Directors’ Guild, the Society for College and University Planning, The Mies van der Rohe Society and the Society of Architectural Historians, where he serves on the Board of Directors. Julie views the multidisciplinary design process as an opportunity to create spaces that both engage and inspire the people who inhabit them. In her role as Creative Director, she has been integral in the development of countless award-winning projects at the Hollywood Bowl for the LA Philharmonic, The Greek Theatre, and many educational and residential projects. Julie is at her best when uniting her passions for architecture and interior design to create holistic environments, designing not only the boundaries of a space, but also the graphics, furnishings, and fixtures that make it inviting. Her experience in crafting acclaimed interiors persuaded her that our firm should also design, manufacture, and sell furnishings that bring rooms to life. That conviction led to the formation of notNeutral, with Julie as its President and CEO. Under her leadership, the notNeutral brand quickly developed a national reputation and a retail presence worldwide. Like our work in architecture, landscapes, and design, every notNeutral product tells its own story, be it a coffee cup, a tea cup, or a vase. And in keeping with Rios Clementi Hale Studios’ transdisciplinary nature, notNeutral’s investigations into color, pattern, and shape influence work in other disciplines. Architect Allison Grace Williams FAIA, has amassed an international portfolio of large scale civic, cultural and research facilities. While in practice at SOM, Perkins+Will and AECOM, Williams’ inventive instincts and interdisciplinary design leadership generated award-winning buildings that bridge culture, technology and the environment and that convey the values and traditions of their audience and place. Her most successful projects and the work of the organizations and institutions with whom she collaborates are in huge part, a commentary on the order of priority they place on the relevant issues of our time. They are reflective of their sponsor's concern for sustainable environments and for inclusive, equitable and socially just outcomes. They also demonstrate a level of tolerance for innovation, risk-taking and doing good, in the hierarchy of other competing business factors. Williams established AGWms_studio in 2017. It is built on her history as a respected team leader, who enlists the power of ideas and design thinking as creative tools in mission-strategic problem solving. Her clients range from corporations and institutions to other design professionals. Through a team-based and cross-disciplinary creative process of defining issues, articulating and prioritizing choices, filtering and consolidating ideas, Williams works with clients to imagine impactful concepts and synergistic design solutions as commentary and narrative on their commitment to shaping a positive future. In addition to design consulting and pro bono efforts, Williams is an adjunct lecturer at Stanford University, a frequent keynote speaker, academic lecturer, and an optimistic mentor to the next generation, in a tapestry of continued design practice. The jury's selections are announced and honored at the annual Awards Celebration. Winning projects are promoted within the Austin community, cultivating an ongoing public interest in architectural excellence.